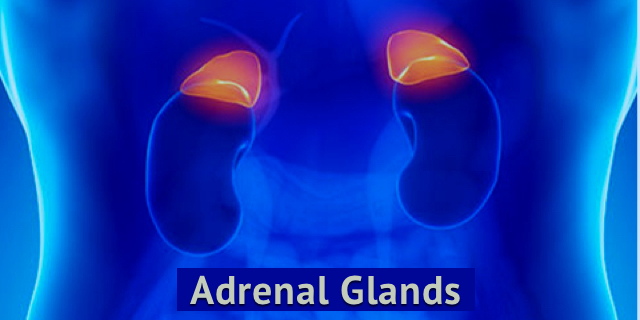 The adrenal glands-which are also called suprarenal glands-are part of the endocrine system and are found on the top of each kidney. Hormones secreted from glands of the endocrine system travel in the bloodstream to target cells. Target cells have receptors that are specific to each hormone. The hormones and receptors on the cell fit like a key and lock. When the hormone reaches its target cell, it joins with the receptor and transmits chemical instructions to the inside of the cell. Although this video the captions in this video are in German, you can see the process. The brain, specifically the hypothalamus and the pituitary gland, controls the production of hormones by the adrenal glands. There is a feedback loop that helps keep the right amount of hormone in the body. For example, in the brain the hypothalamus produces corticotropin-releasing hormone (CRH). CHR then stimulates the pituitary gland to secrete adrenocorticotropin hormone (ACTH). This ACTH then enters the blood stream and stimulates the adrenal glands to release cortisol into the blood. Finally, both the hypothalamus and pituitary gland sense the amount of hormone in the blood and reduce or increase the production of their respective secretions to maintain balance in the blood stream. 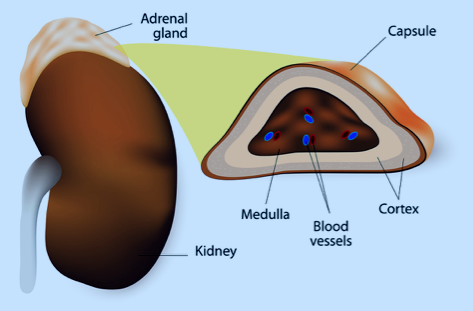 There are two parts to an adrenal gland-the outer part is the largest and is called the cortex. It produces corticosteroids. Corticosteroids are cortisol, aldosterone as well as DHEA and androgenic steroids. Cortisol is important to a number of processes in the body. It regulates blood pressure, increases blood sugar, decreases bone formation and reduces inflammation. It is involved the use of fats, proteins and carbohydrates. It also controls your circadian rhythm. And it is released to help you cope with stressful or emergency situations to increase the body’s energy level. Aldosterone controls blood stream electrolytes-sodium and potassium-to regulate blood pressure. It does this by instructing the kidneys to absorb sodium from the blood and releasing potassium in urine. DHEA and androgenic steroids are male hormones that are converted to estrogen in ovaries and testosterone in testes. The inner part of the adrenal gland is called the medulla. It produces the catecholamines- epinephrine or adrenaline and norepinephrine. These hormones are involved in helping the body cope with physical and emotional stress. They increase heart rate, thus increasing blood going to the muscles and the brain. If your adrenal glands don’t produce enough cortisol and/or aldosterone, you have adrenal insufficiency-also called Addisons disease. If the pituitary gland produces too little ACTH, a condition called secondary adrenal insufficiency occurs. Symptoms of either type of adrenal insufficiency are chronic fatigue, loss of weight, appetite, abdominal pain and muscle weakness. Fainting, headache, excessive sweating and depression are other symptoms. Hormones can be overproduced. The symptoms you experience depend on the hormone. Androgenic steroids If your adrenal gland makes too many adrogenic steroids, it can lead to excessive male characteristics, like facial hair and baldness in both men and women. Aldosterone When aldosterone is overproduced, people experience high blood pressure and low potassium levels. If your potassium is too low, it can affect your muscles causing weakness, spasms and paralysis. Cortisol A condition known as Cushing syndrome is caused by too much cortisol. One possible cause of this overproduction is long time use of steroids for autoimmune conditions like rheumatoid arthritis or lupus. Cushing syndrome can also be caused by a tumor in the pituitary gland which causes the pituitary to produce too much ACTH. Symptoms include weight gain, thinning arms and legs, fatigue, high blood pressure and easy bruising. Very interesting video presentation. I enjoy reading your post, anything about how how our overall health system works fascinates me. Thank you for sharing. What if your Adneral gland is swollen due to Continuing High Blood Pressure How do u control it?? High blood pressure for years low potassium levels.